The word halal in Arabic means permitted or lawful. It is used to reference any behavior or object that is permitted under Islamic law. Therefore, halal foods are foods that are allowed to be consumed under Islamic dietary guidelines. The foods that are not permitted are called haram, meaning "forbidden" in Arabic. The word kosher is Hebrew for "proper" or "fit" which is similar to the Arabic word halal. However, whereas Jews do not speak the name of God each time they slaughter an animal, Muslims perform a prayer over the first and last animal in any given slaughter. According to these guidelines that were gathered from the Qu'ran, Muslim followers cannot consume several different types of foods. These include pork or pork by-products, animals that were dead prior to slaughtering, and animals not slaughtered properly or not slaughtered in the name of Allah. Other forms of protein that are forbidden are carnivorous animals, birds of prey, and land animals without external ears. Additional harams are blood and blood by-products as well as alcohol. Muslims are taught through the Qu'ran that all animals should be treated with respect and be well cared for. Therefore the goal in halal-style butchery is to slaughter the animal in a manner which will limit the amount of pain the animal will endure. When an animal is slaughtered, the jugular vein is cut and the blood is allowed to drain from the animal. This practice is done because Muslims are prohibited from consuming animal blood. The animal must also be given food and water prior to being slaughtered, must not be suffering from any ailments, and it must be made sure that no other animal can be witness to the slaughter. The knife used needs to be very sharp and four times the size of the neck of the animal that is to be cut. In addition, since pork is forbidden, the slaughtering cannot be practiced where pigs are slaughtered. Halal foods can be found in many Middle Eastern grocers. In larger cities, you may also be able to find halal butchers. With the growing demand for halal foods in certain areas, some national supermarket chains are carrying halal meats and even halal turkeys for Thanksgiving. There are also many online stores that now offer halal foods. 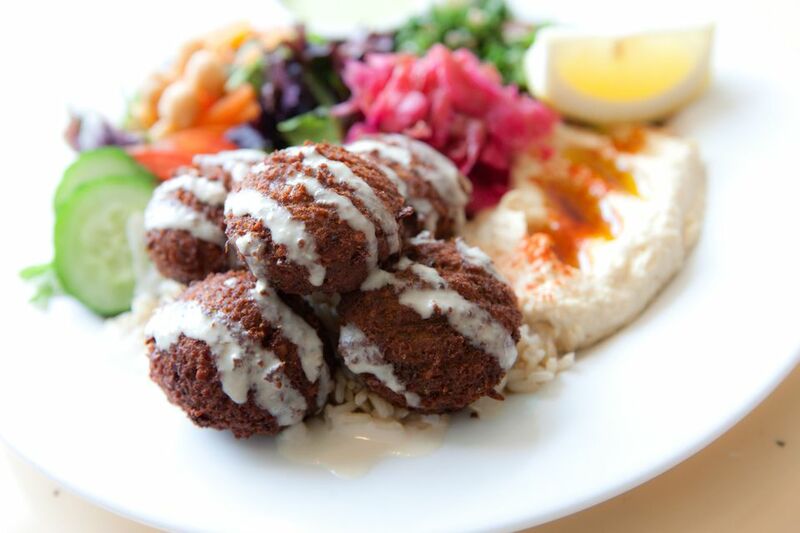 In large metropolitan areas, halal has also come to casually mean Middle Eastern cuisine. In New York and other cities with food truck cultures, halal carts and trucks are seen as sources of dishes such as falafel, shawarma, and flavorful kabobs. Some of these food trucks have developed a following, which, in turn, has led some halal-style food truck owners to open restaurants serving the same Middle Eastern cuisine. Some popular casual street food halal dishes are chicken, gyros, or falafel served either platter-style with rice, or wrapped in a pita with lettuce and tomatoes and a white, tahini-based sauce or a red, harissa based sauce. Side dishes might include hummus or tahini and baklava is commonly offered as a dessert option.